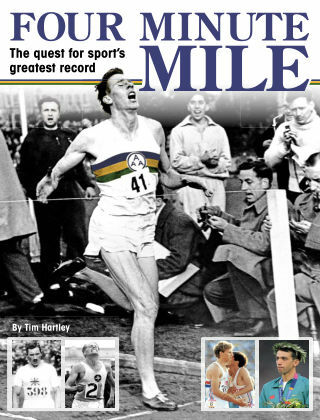 With Readly you can read Four Minute Mile: The Quest for Sport’s Greatest Record and thousands of other magazines on your tablet and smartphone. Get access to all with just one subscription. New releases and back issues – all included. Six decades ago, on a windswept and overcast evening in Oxford in May 1954, a 25-year-old medical student rewrote the sporting history books and captured the imagination of the world. Roger Bannister, with the help of his friends Chris Brasher and Chris Chataway, became the first man to run a mile in less than four minutes. It was the culmination of years of effort from athletes the world over, including such greats as New Zealander Jack Lovelock, the fantastic Finn Paavo Nurmi, and the Swedish duo Gunder Haegg and Arne Andersson. All had tried, and all had failed to break a barrier some said was mental, others claimed was physical. Bannister held the world mile record for just over a month, yet his achievement became one of the most famous in history. The pure symmetry of the event – four laps in four minutes – was part of its aura. This publication looks at the history of the distance as a race, some of the great characters, examines Bannister’s record effort and the training he endured to get there, and what has happened to the world mile best since.